As a pet boarding and daycare facility, we love all types of animals and we welcome dogs, cats and even exotic pets here at Cascade Kennels. However, there is one type of animal that never ceases to amaze us and has always held a very special place in the hearts of our staff and that is Assistance Dogs. Assistance dogs are nothing less than walking, four-legged miracles. Most of us, if asked, would certainly be able to answer this question. Generally speaking, Assistance dogs are dogs that have been trained to provide on-going aid or assistance to an individual with a disability. That’s the basic definition of what an Assistance dog is, however, there are a few specific types of assistance dogs that have been trained to provide their owners with a particular type of help. Guide Dogs: Guide dogs are specifically trained to help the blind. They function as their owners’ eyes. Hearing Dogs: Hearing dogs are trained to be the “ears” of their owners. Service Dogs: Service dogs are trained for a more general function of helping their owners with other types of disabilities such as physical or mental. 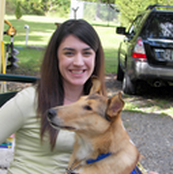 In our area, there are two organizations that raise and train Assistance dogs, they are Brigadoon Service Dogs in Bellingham and Summit Assistance Dogs in Anacortes. Both organizations work tirelessly to train the animals to serve their owners and then take time to ensure that the dog is well suited to the individual in need. We’d like to share with you some success stories of each organization and how these miraculous dogs are improving the lives of their owners. Briana & Mabel: Briana is a Woodinville resident who struggles with a lung disease and is wheel-chair bound. Her vision and hearing are also impaired and she was in need to continual assistance. She reached out to Summit Assistance dogs and was eventually matched with Mabel. Mabel helps her get around safely, opens doors, picks up dropped items and is continually by Briana’s side. 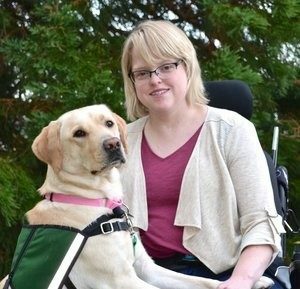 Thanks to the assistance that she gets from her service dog, Briana is a student at a local community college and is able to successfully navigate her surroundings thanks to Mabel. Christopher & Campbell: Christopher and Campbell were matched a few years ago through Summit’s program. Christopher suffers a lack of mobility, is blind and has no verbal function. However, when Campbell came into his life, Christopher’s mother noticed a very positive change in her son. Campbell acts as Christopher’s eyes but he also helps Christopher to be more aware of his surroundings which has been a huge blessing for their family. These are just a few of the many lives that have been changed for the better thanks to Assistance dogs. It is nothing less than miraculous that a dog can be trained to help an individual with their day-to-day tasks and bring so much peace, joy and independence to these individuals. These animals truly are four-legged miracles. If you are interested in learning more about either of these organizations, click the links below.